In this tutorial, you'll see how easy it is to transform a static slide into an interactive assessment using the convert to freeform feature. To convert a slide to a freeform question, you’ll need a slide with some content. Open the 04B_Quiz_Freeform.story file from the practice files and go to the second slide (1.2 Practice). Add a rectangular hotspot over the center of the box. We'll use this as our drop target. Delete the default trigger that comes with the hotspot. We'll follow good practices and rename Hotspot 1 to target on the timeline. Go to the Insert tab on the ribbon. Click Convert to Freeform and choose Drag and Drop. This opens a form with two columns. In the left column, choose the objects that will be draggable. 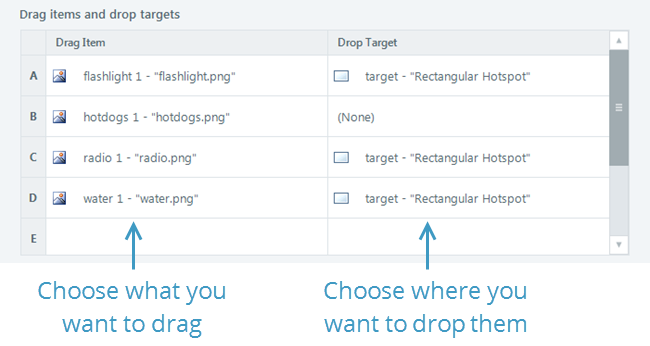 In the right column, choose a drop target for each drag item. We’ll keep the default feedback. Go ahead and Preview the slide to see how it works. Notice how you can drag the objects on the screen. That’s it. You converted a slide and its objects to a freeform drag-and-drop question. In Slide view, you’ll notice that Articulate Storyline has added layers for incorrect and correct feedback, along with a submit trigger. Now it's your turn. 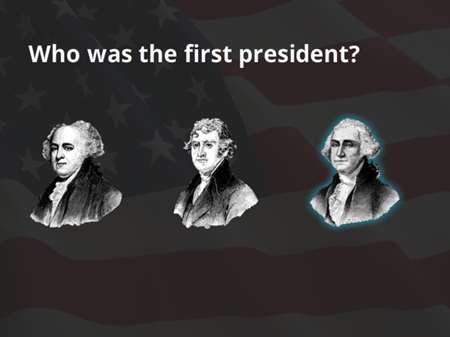 Go to the third slide and convert the multiple-choice question we created in an earlier tutorial into a visual Freeform Pick-One question. Hint: Delete the existing text answer elements first. There’s a lot more you can do with the freeform conversion, so play around with it! Next, you'll learn how to give learners feedback on a quiz and track their results in an LMS or Articulate Online by creating a result slide.